Station Hollywood: No one will forget the romantic films of Shashi Kapoor and brilliant songs. No one will forget the romantic films of Shashi Kapoor and brilliant songs. It is very sad that romantic star Shashi Kapoor passed away on the 4th December, 2017. He died at the age of 79 years. He remained immortal in more than 150 films that he had acted in. The viewers of bollywood films wish happy birthday to Shashi Kapoor on 18th March, 2017. In 2011 he received the filmfare lifetime achievement award. In 2011, he received Padmabhushan, the civilian award for his excellence in bollywood films. His sickness prevents him from freely walking, but he receives most of his awards on wheel chair. Born in 1938, Shashi Kapoor started his acting career in the film Aag in 1948 directed by his elder brother Raj Kapoor. He also showed his acting skills as a child artist in the film Awara in 1951. The film won different awards in international film festivals and ended up being super hit. Shashi Kapoor acted in off-beat films at the beginning of his career like Prempatra opposite Sadhna. He entertained the audience with the film Jab Jab Phool Khilen in 1965. All the songs of Rafi composed by Kalyanji Anandji in the film became super hit like “pardesiyon se na”, “yahan mai ajnabee hoon”, “na na karke pyar”, etc. From that time Shashi Kapoor acted with Nanda in a number of films like Muhabbat Is Ko Kehte Hai, Neend Hamari Khwab Tumhari, etc. Rafi’s songs in many Shashi Kapoor films did magic including “o dilbar janiye”, “dilbar dilbar”, “bekhudi me sanam”, to name a few. Shankar Jaikishan gave notable tunes to Shashi Kapoor in the film Kanyadan. Madanmohan gave notable tunes to Shashi Kapoor in the film Neend Hamari Khwab Tumhari. In the late 60s Shashi Kapoor acted in many romantic films like Pyar Kiye Jaa, Kanyadaan, Abhinetri, Ek Shriman Ek Shrimati, etc. In Pyar Kiye Ja, he acted opposite actress Nanda, in Kanyadan he acted opposite Asha Parekh, in Abhinetri he acted opposite Hema Malini, in Ek Shriman Ek Shrimati he acted opposite Babita. In the 70s, Shashi Kapoor acted in action films along with Amitabh Bacchan, at a time when action films dominated either types of films in bollywood. His dialogue in the film Dewaar opposite Big B titled “mere paas ma hai” became immortal over the years. He acted in many films opposite Big B like Shaan, Do Aur Do Paanch, Iman Dharam, Namakhalal, Suhaag, Kala Pathhar, Kabhi Kabhi,Trishul, Silsila, etc., and most of those films ended up being blockbusters. Some of these films were multi-starred in nature. For example in Shaan and Kala Patthar he acted opposite Big B and Shatrughun Sinha. It was his sheer talent, that he could adapt himself in the new regime of anti-establishment films in the 70s, starting from Dewaar, which were quite different from the society shown in the romantic films of the 60s. He acted with other bollywood actors like Shatrughun Sinha in films like Gautam Govinda. 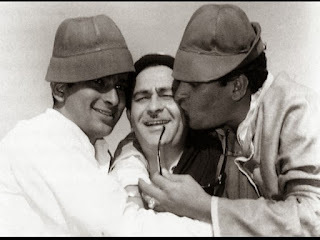 He was a close friend of Ismail Merchant and featured in many of his English films like Siddharta. He produced impressive films like Junoon directed by Shyam Benegal and Vijeta directed by Govind Nihalini. His sons Kunal Kapoor and Karan Kapoor acted in many films. In the 1990s, Shashi Kapoor put on a lot of weight and stopped acting. He was in tears to receive the filmfare lifetime achievement award. The viewers pay homage to the veteran actor and revisit his films for their huge success.